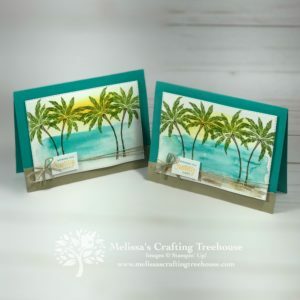 Today’s projects feature embossed foil art with custom colored foil. 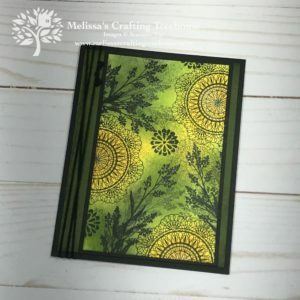 I’ve used a variety of embossing folders including the Tin Tile, Tufted, Layered Leaves, and Subtle embossing folders. 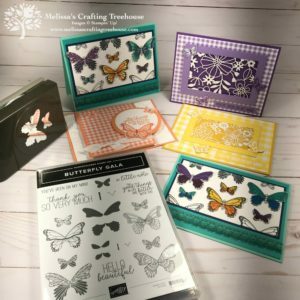 These embossing folders are definitely the star of the show! 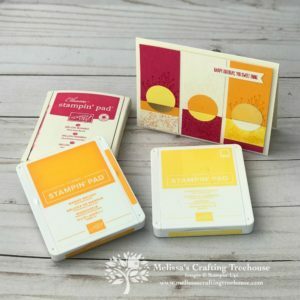 As you may know, I LOVE, LOVE LOVE playing with the Stampin’ Up! 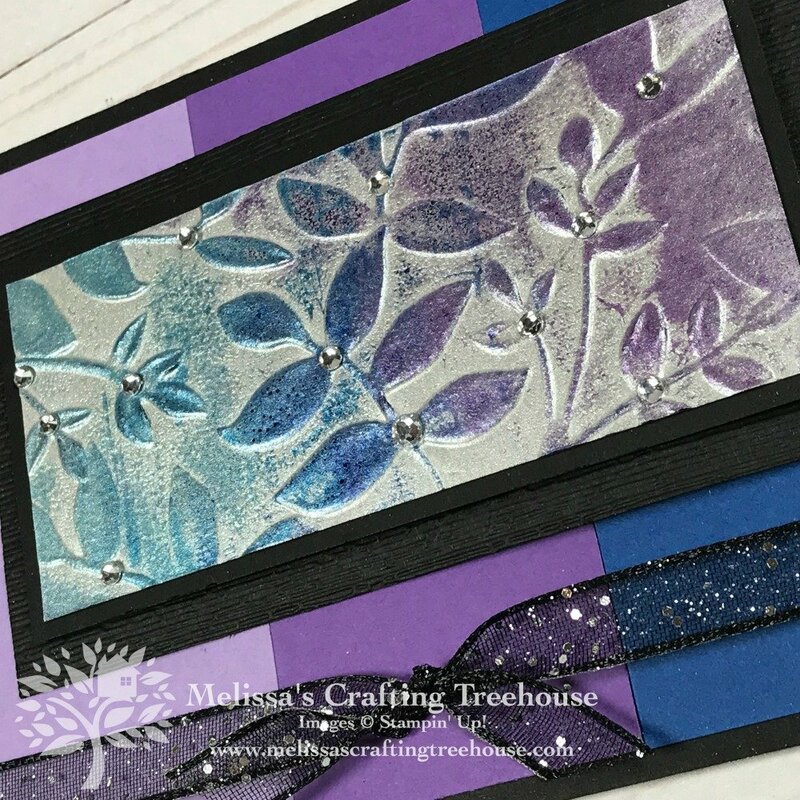 foil sheets and I love both heat and dry embossing! 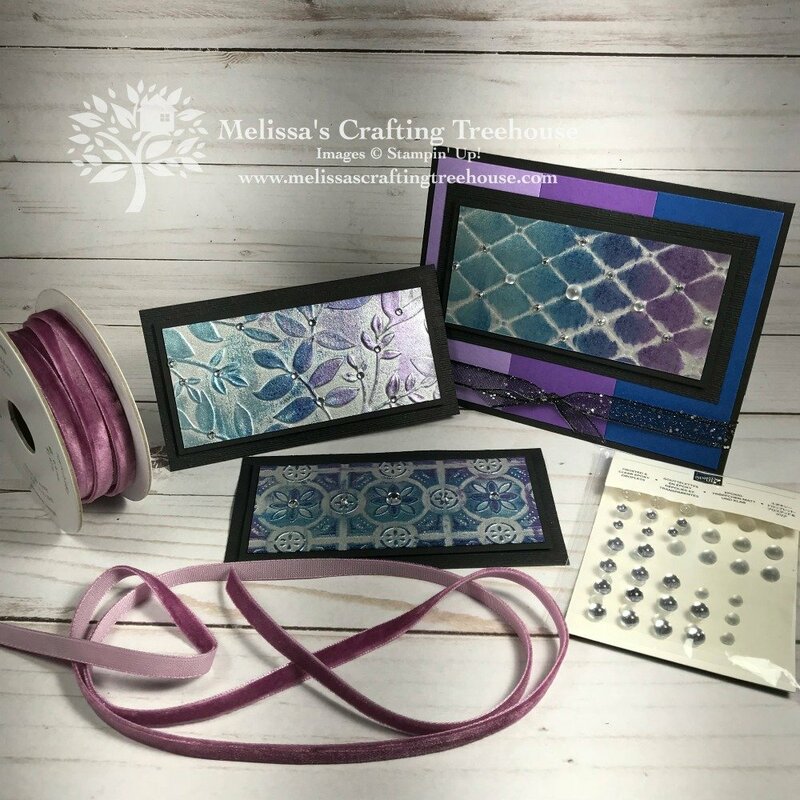 Combine the two and there are so many opportunities for embossed foil art! We now have several colors of foil including, silver, gold, copper, champagne, black and finally galvanized foil sheets. There’s a new color coming out in January as well which I can’t wait to get and play with! More on that later. 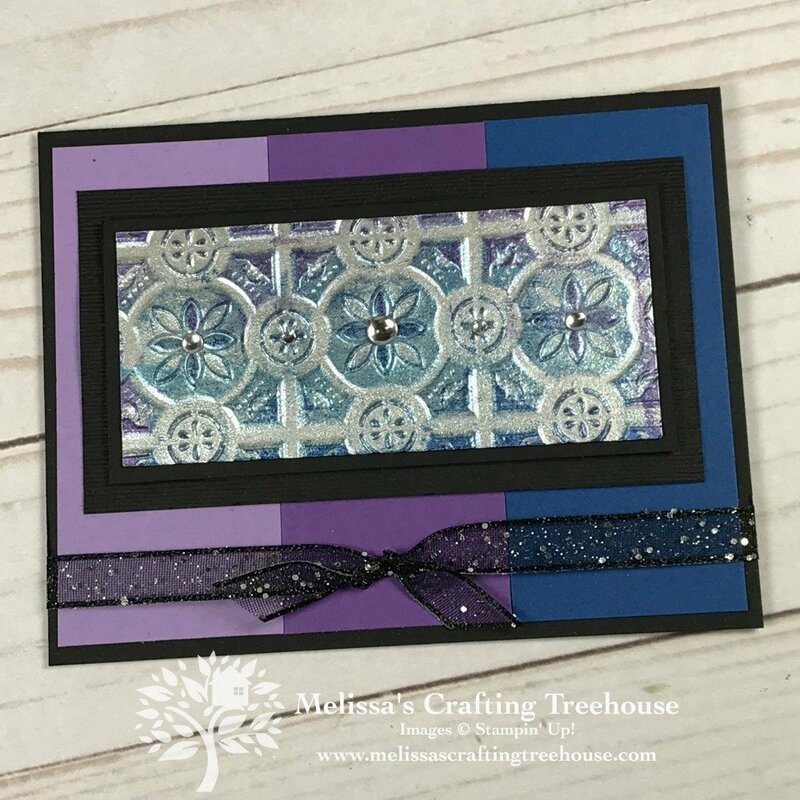 Today’s cards feature the NEW Galvanized Foil sheets that are in the holiday catalog. These sheets are different from the other foil colors in two main ways. First, the finish is a matte instead of a shiny surface. 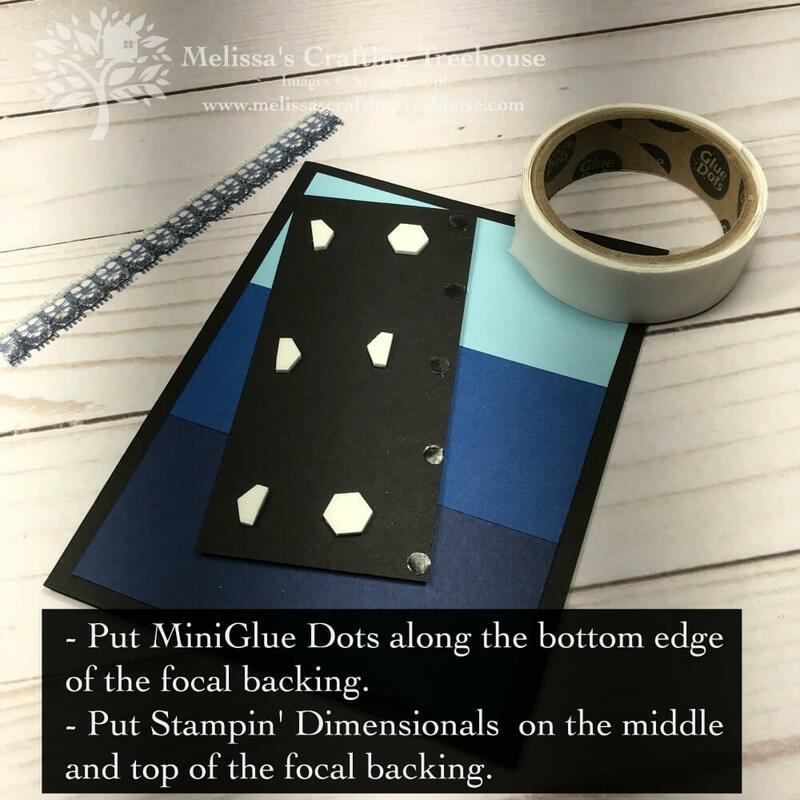 Second, the galvanized finish is on both sides of the paper instead of on just one side, which makes these sheets a bit more versatile and easy to use. So I’m calling this embossed foil art because I’ve taken my embossed foil piece and applied color for some really fun effects. This first one looks sort of like Ombre and I’ve used the debossed side of the galvanized foil. So it’s actually really easy to apply color to these foil sheets but the trick is getting it to stick! Normally to heat emboss you would need to apply a sticky ink like Versamark. For this project, you can skip that step. 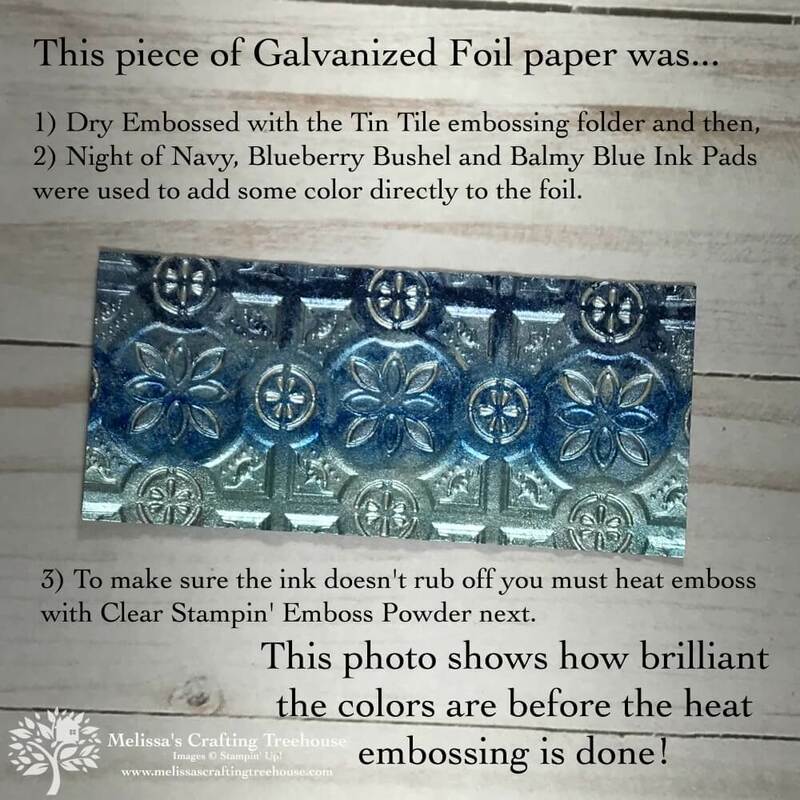 The ink you’ve applied to the galvanized foil will stay wet for a while since the foil is a non-porous surface. 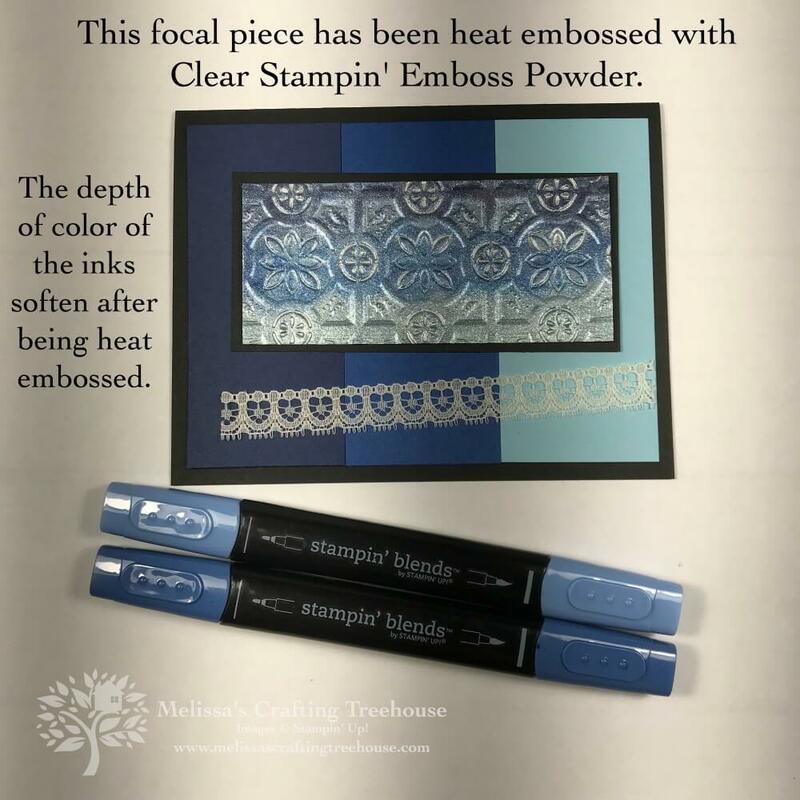 After applying the ink you just pour Clear Stampin’ Emboss powder over the whole surface, tap off the excess and then heat your focal piece to melt the embossing powder. As you can see here the ink colors become more muted once the clear embossing powder is heated. 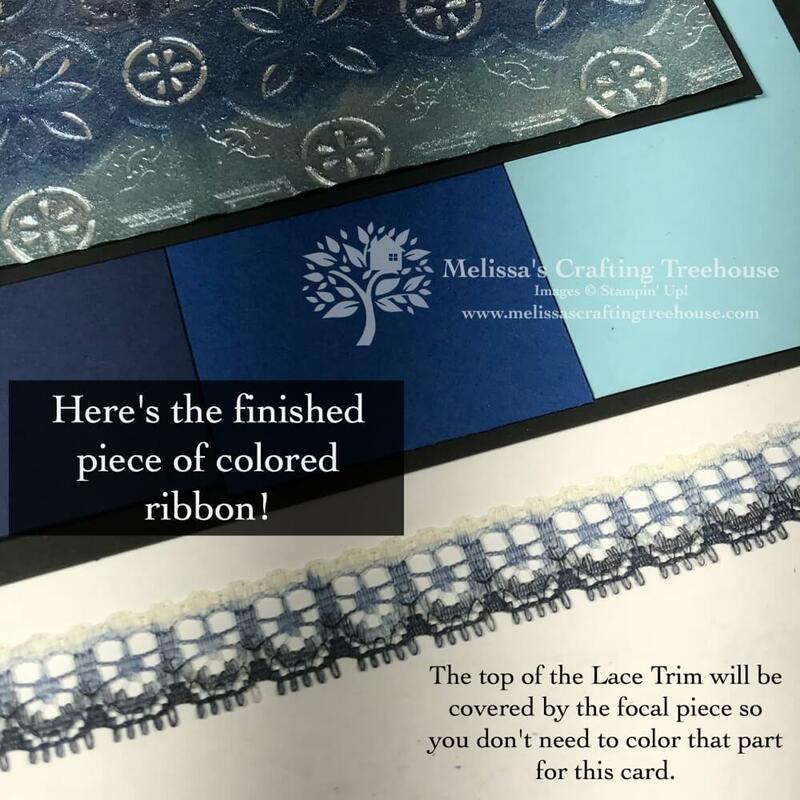 For this particular card, I’ve also custom colored my Lace Trim to mirror the ombre effect on my focal piece. 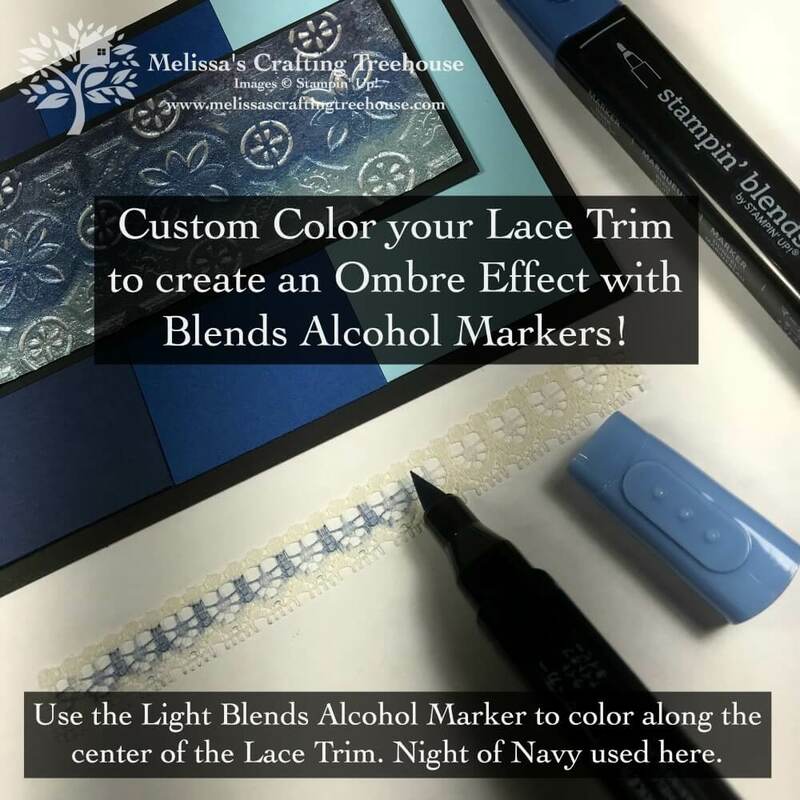 I love the Blends Alcohol Markers for coloring all kinds of elements including ribbon, rhinestone jewels and more! The flat edge of the paintbrush side, of my Light Night of Navy Blends Alcohol marker, was used to get the color down the middle of the ribbon. 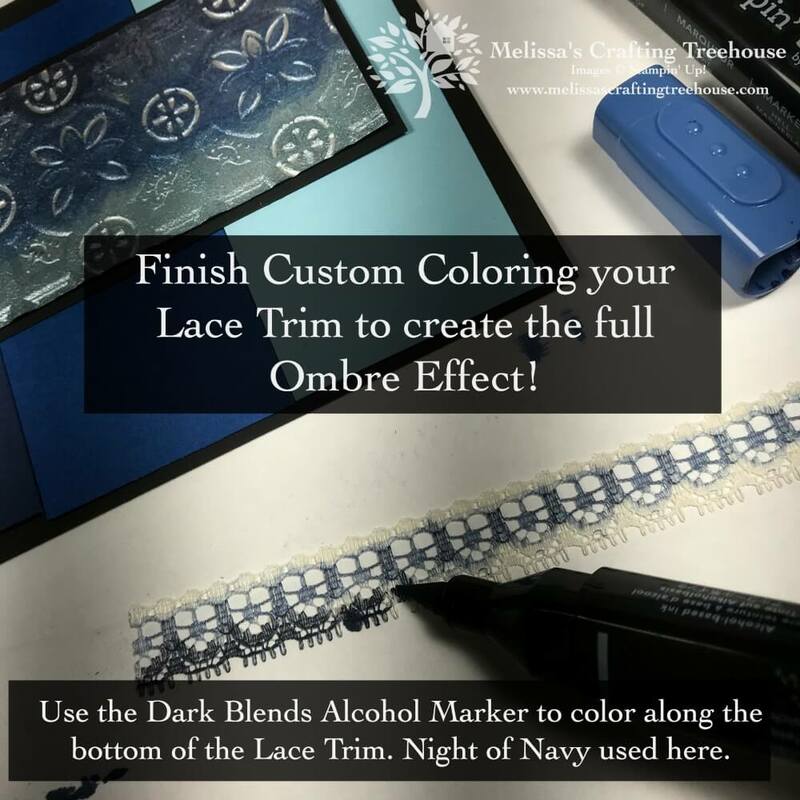 I used the point of the paintbrush end of my Dark Night of Navy Blends Alcohol marker, to get color down the edge of my ribbon, to create the contrast needed for the Ombre effect. To finish off this project I simply added my Frosted Epoxy Droplets to the center of each floral element on the focal piece. I love these new embellishments! Whenever I create I almost always try a bunch of different things before I settle on the focal piece and card design. I like to call it the “practice” of paper crafting just like someone might say the practice of medicine or the practice of yoga. The focal piece just ahead was actually my “reject” piece. Even though it’s really pretty it just didn’t go as well with the blue panels in behind. So… what you see below is actually the backside (the embossed side) of the piece that is actually on my card above (the debossed side). I really love the color scheme below so I was determined to come up with another design to show off these colors. 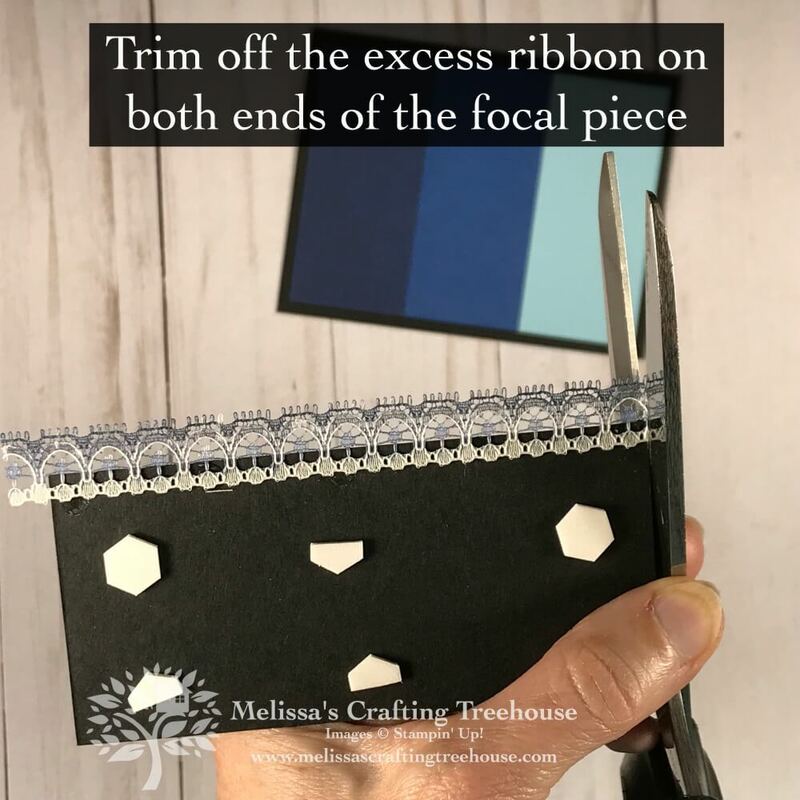 That brings me to the project focal pieces I made in my recent Facebook Live! For the card and pieces just ahead I actually used an Uninked Spectrum Pad and inked it up with the following five colors of ink refills: Balmy Blue, Pacific Point, Blueberry Bushel, Gorgeous Grape, and Highland Heather. 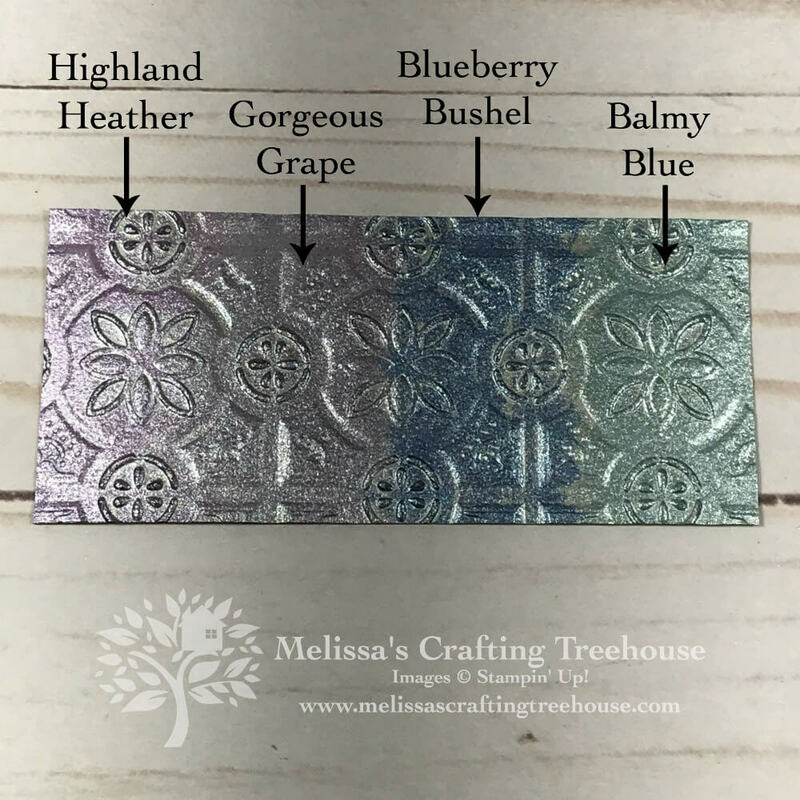 Then I dry embossed each of the three galvanized foil focal pieces with one of the following embossing folders: Tufted, Layered Leaves, and Tin Tile embossing folders. 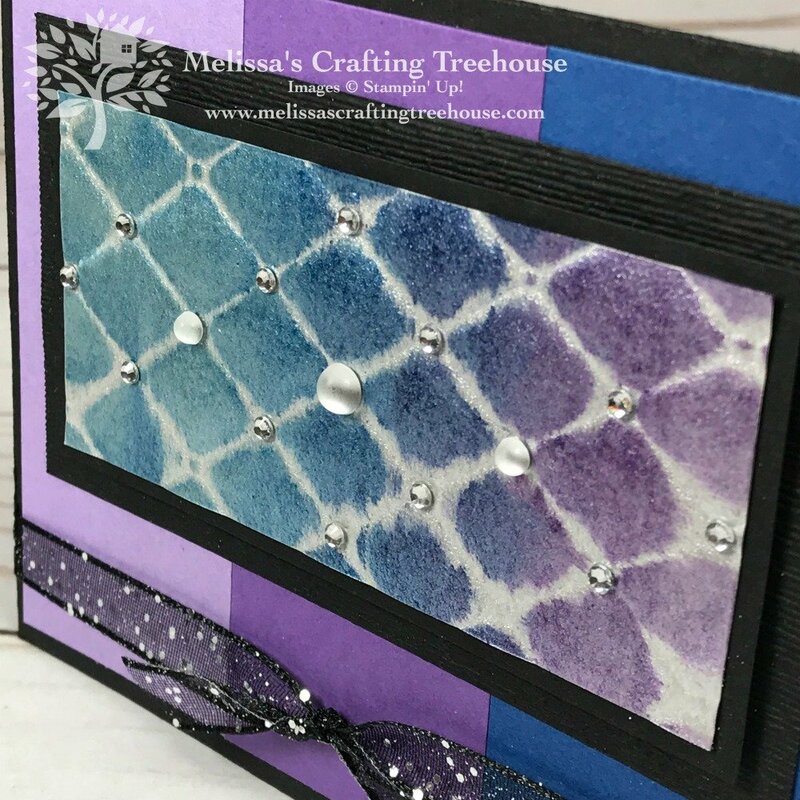 I just had to mix things up a bit to see what these different embossing folders would look like with this technique and I’m so glad I did because I LOVE the different looks and effects I got! For the focal piece just ahead, I started with just inking the foil by pressing it against the spectrum pad to mirror the colors on the pad. This is called the direct to paper technique. It just looked boring to me that way so I just started applying color here and there to mix it up a bit. It’s so different from either of the two other versions made with this same embossing folder. It’s unique and it’s own form of embossed foil art! I used the shiny Epoxy Droplets on this one. 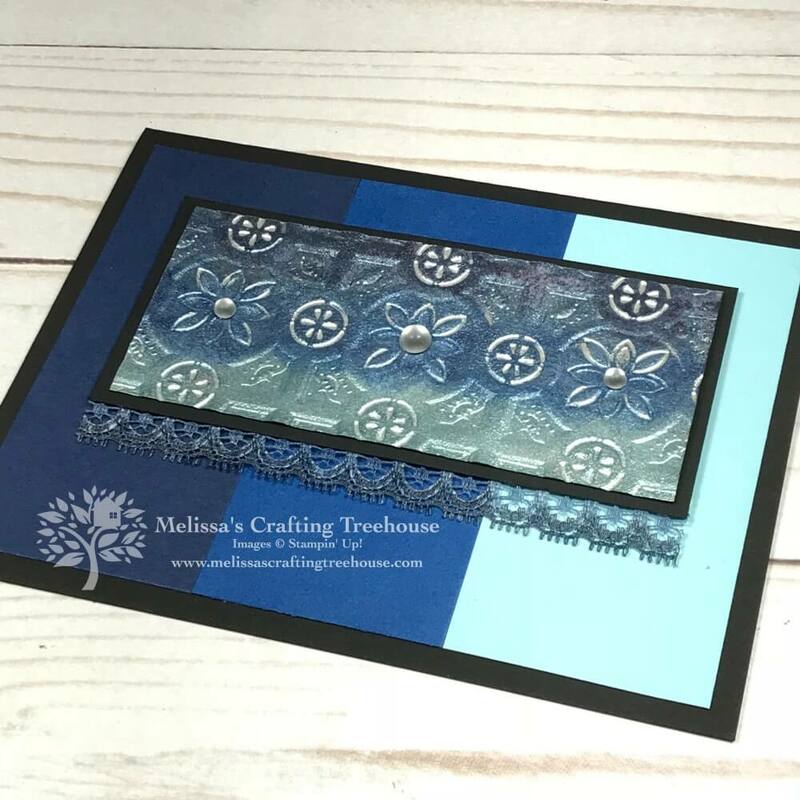 These new cards also bring in the gorgeous Glittered Organdy Ribbon which I just love! For this next piece of embossed foil art, I mostly applied the color to mirror the position of the colors in the Spectrum Pad, however, I did apply two rounds of ink and two rounds of clear heat embossing. After the first round, I just felt like it needed more color in select spots. I love my blue and purple leaves in this focal piece! What do you think of the Rhinestone Jewels as an added element? 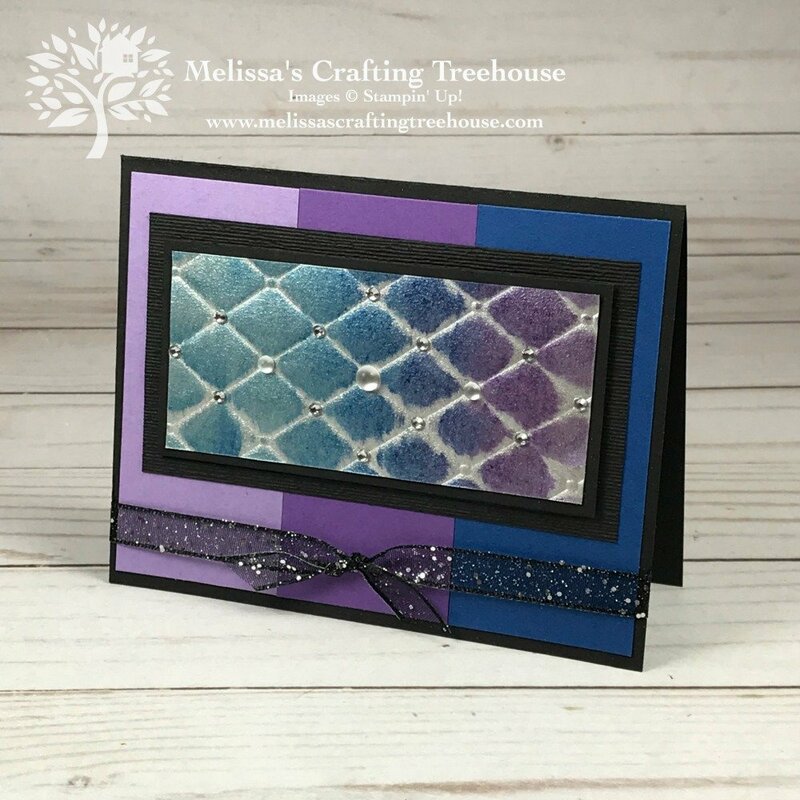 Last but not least is my version using the Tufted Embossing Folder. 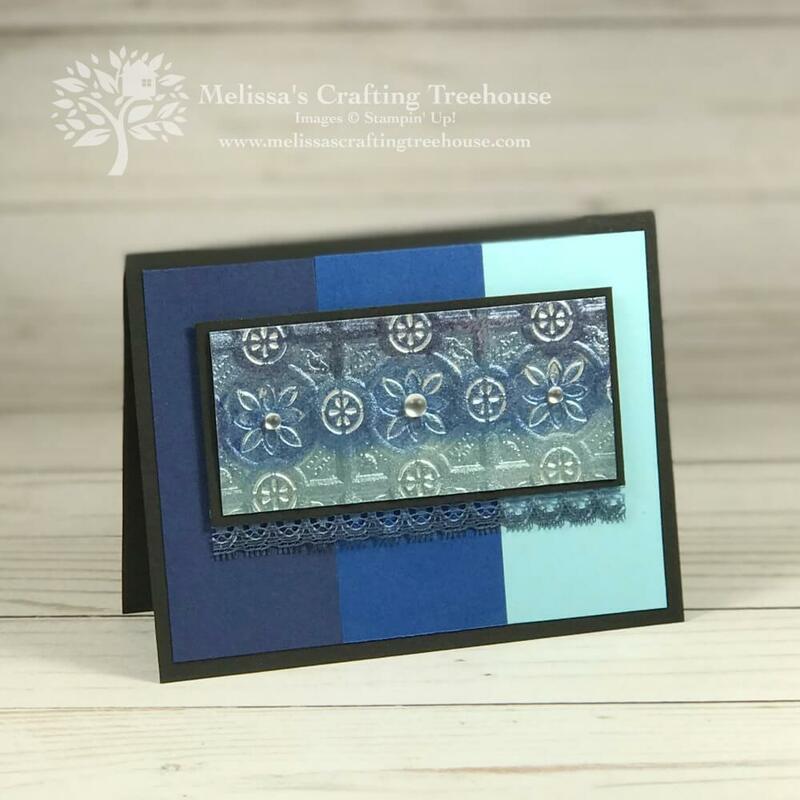 For all three of these cards, I decided not to use the Lace Trim in favor of the Glittered Organdy Ribbon. I’ve also added one more layer of Basic Black cardstock that is dry embossed with the Subtle Embossing Folder. I felt like I needed more framing for the focal piece. In the close up below you should be able to see that dry embossed piece in behind. Dimensionals were used in behind the smaller Basic Black layer in behind the focal piece. 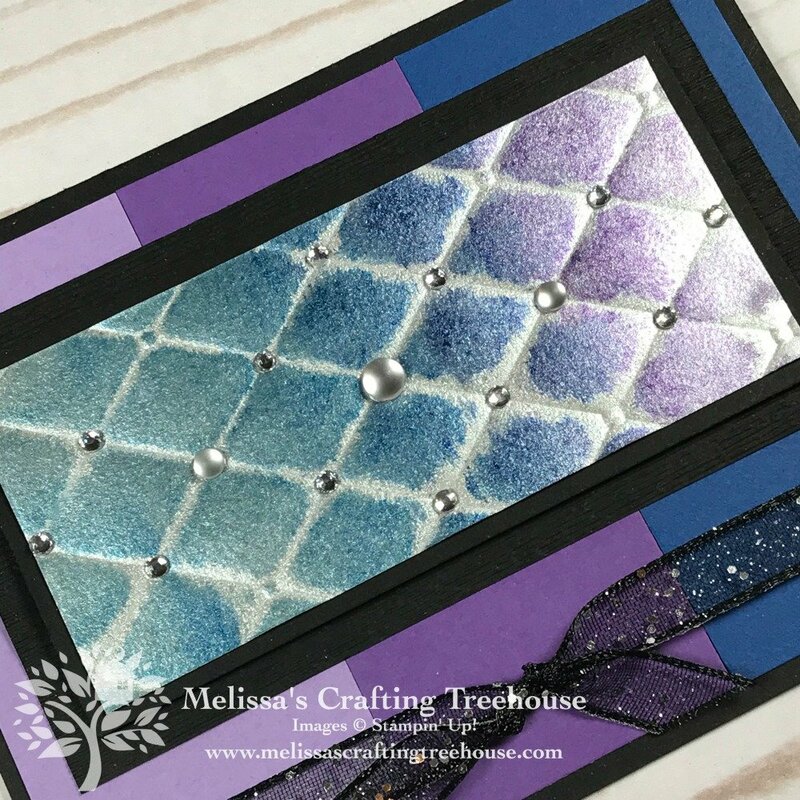 For this card, I used a combination of the Frosted Epoxy Droplets and Rhinestone Jewels. I hope you’ve enjoyed all these project variations! You’ll find a complete supply list with links to my Online Store, plus project dimensions, at the end of this post. It’s so much simpler to design when you have a layout to start with! 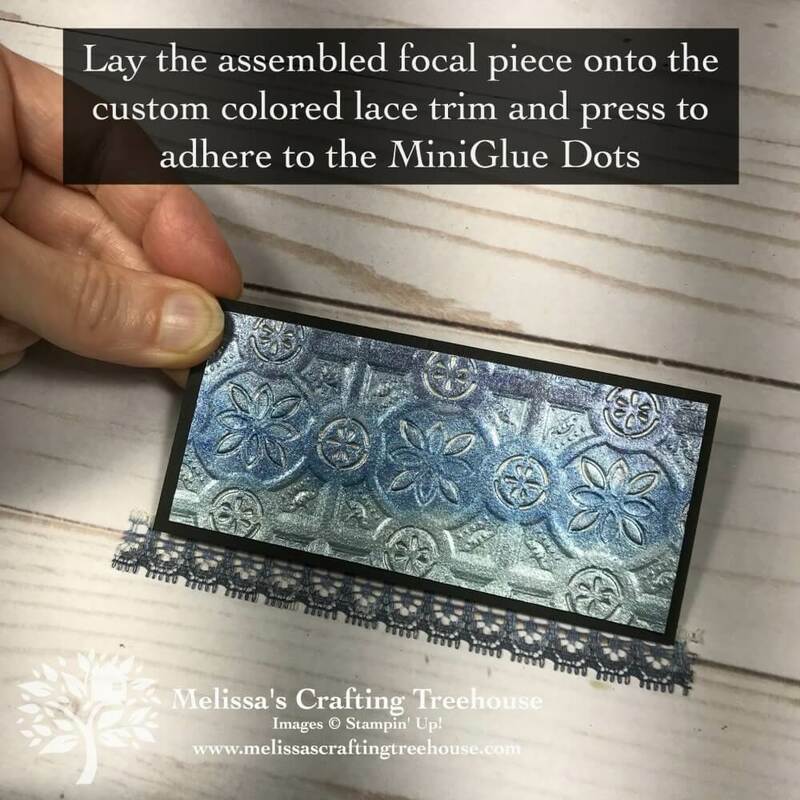 If you’d like to see me creating some of these embossed foil art focal pieces, in my recent Facebook Live, make sure to check out the video just ahead. I’ll be doing Facebook Live events every Thursday at 4 pm EST (unless there’s a holiday). My next event will be on 11/27/18! 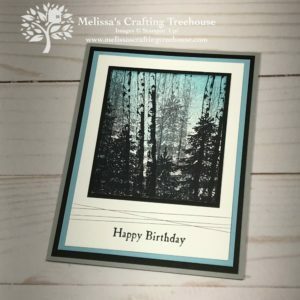 Like and follow my Melissa’s Crafting Treehouse Facebook page, so you’ll receive notifications for when I go Live! Thanks for spending some time with me today! 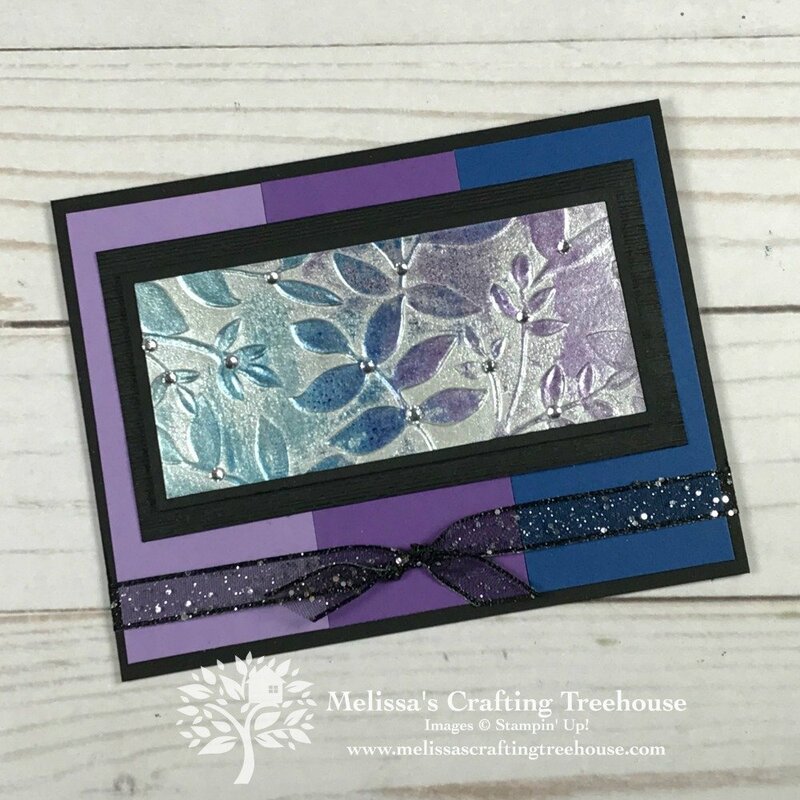 I hope you learned something and are inspired to play with your own embossed foil art projects! There are lots of announcements and sharing at the beginning of this video. The project demonstration starts at about 34 minutes if you want to jump ahead. 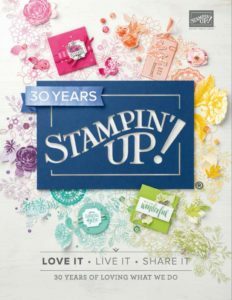 Click HERE to watch a Stampin’ Up! 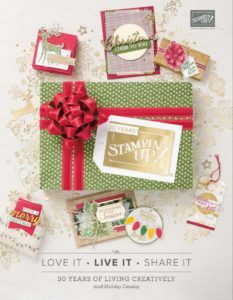 video featuring these products so you’ll see these products come to life on some fun projects! 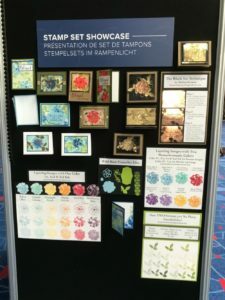 ← Card Swaps at OnStage Live!